The child, left unsupervised in her fourth floor home, had fallen out of a window. The dramatic moment a man climbed over balconies to save a toddler has been caught on camera. 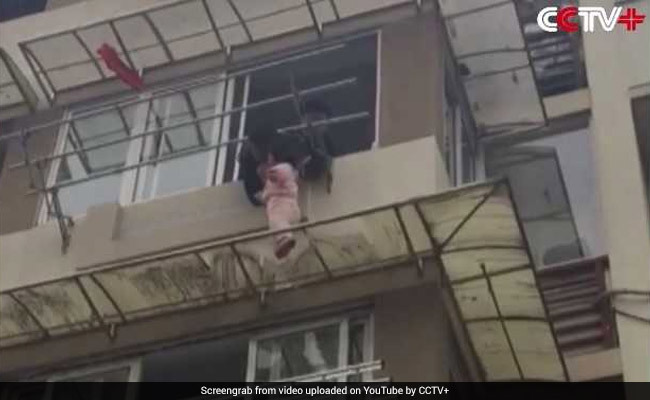 Footage captured shows the man rescuing the child trapped on the awning of a third floor window in China. The incident occurred on January 19 in Hangzhou in China's Zhejiang Province. According to CCTV+, the child was left unsupervised in her home on the fourth floor when she slipped and fell out of a window. She ended up the window canopy below. To make matters worse, the awning was old and giving way in places. The little girl was in a scary predicament but thanks to the Good Samaritan, she was saved in the nick of time. Long Chunqun, a store owner close to the building, was among the first to rush to the girl's aide. He climbed over one balcony into the other to rescue the girl. A pet store owner, identified as He, held his feet while he reached out for the child and pulled her back up into the house.